Witches and goblins and ghosts, oh my! It’s almost time to hit the store and stock up on candy and treats for the neighborhood kids. 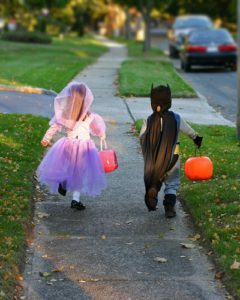 Halloween trick-or-treating is one of the most exciting nights of the year for kids (and even some adults). And while the holiday puts an emphasis on fun, homeowners should take some time before the big event to make sure that the evening is safe, too. Here are our tips to make sure your evening goes off without a hitch. Halloween is good motivation to get all those dead leaves cleaned up in the yard. Kids are very excited on Halloween. Fueled by sugar, they race from house to house, eager for the next treat. It’s dark, and their vision may be hampered by a costume or mask, so it’s essential that you remove anything that could trip them up. This is especially true if you think they may cut through your yard on the way to the next house. While complete darkness no doubt adds to the scariness factor, it’s important to have enough light so people can see where they are going. Keep your porch light on so trick-or-treaters know that you’re giving out candy, and make sure they can clearly see the path to your front door. Light it up with some spooky lights if you need to – just make sure they’re tucked away so nobody trips on them. While candles are the traditional method for lighting up those spooky jack o’ lanterns, they’re not the safest choice. Instead, opt for some electric candles or even glow sticks to put inside pumpkins or other luminaries. Yes, that spider costume you got for your pet pooch is awesome, but it’s not a great idea to have your dogs or other pets out on Halloween night. Even if your pet is super friendly, it can get chaotic with kids constantly coming to the door, which could affect your pet in unforeseen ways. And you never know which kids might be scared of your pet, no matter how cuddly you think he is. A scary-looking scarecrow set up in your yard is a great gag for spooking kids. Just don’t give him a real pitchfork to hold – you never know what might happen. Instead, opt for gags that use harmless materials like rubber or plastic. Will you be away from home on Halloween? Don’t forget to set your alarm. It is one of the busiest nights for burglaries and vandalism, so you’ll want to be sure you’re protected. It’s also a good idea to let the neighbors know you’ll be away from home, so they can keep an eye out for any suspicious behavior. Whenever you have guests over, even if it’s just kids going from door to door looking for some free candy, you open yourself up to liability. Check your homeowner’s insurance to make sure that you are adequately covered in the case of an accident. By following the tips above, you’ll be sure to have a spooktacular night of trick-or-treating. Happy Halloween!